Increasing the resource of the engine operation – protective layer greatly reduces the wear of the most loaded friction parts, which determine engine life. Protection in extreme working conditions – protective layer effectively prevents wear of friction parts at high loads due to the structural features (micro-hardness and micro-elasticity) and retention of larger amount of oil. Protection during active driving – treated surfaces keep a denser oil layer, which reduces wear and compensates for oil starvation during fast increase in engine speed. Fuel economy – the protective layer and the oil retained by it seal clearances in the cylinder-piston group. This leads to compression recovering, improves combustion quality, reduces friction losses and reduces fuel consumption by6 - 8%. Noise and vibration levels reduction – recovering of compression in the cylinders leads to smooth engine running. In addition, a dense layer of oil softens work of friction parts. Altogether, thisreduces vibrationand noisein the engine. Toxicity reduction – recovering of compression and optimization of gaps in the cylinder-piston group improves combustion quality, which in turn decreases exhaust CO/CH emissions. 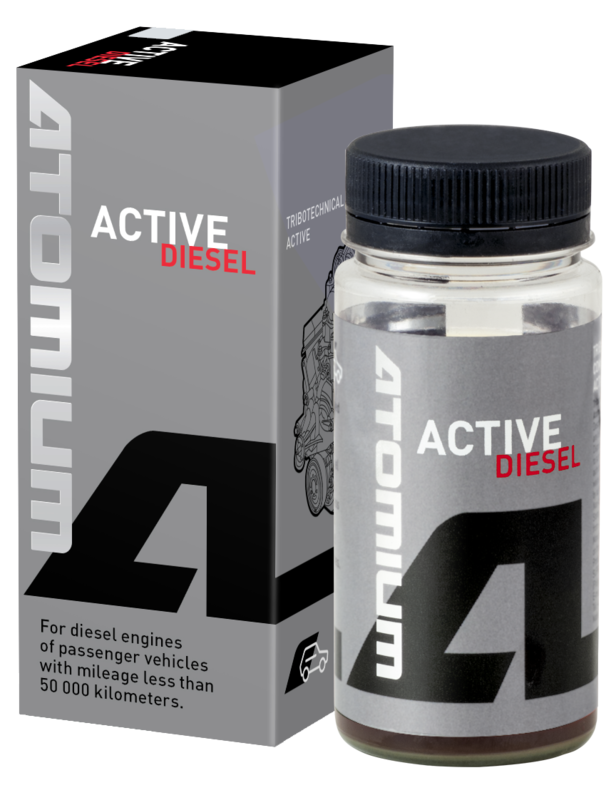 Decreases toxicity of exhaust gases. · It is not expected any health hazard when used under normal conditions. · In case of a contact with skin, wash out with warm water, and then wash again with soap. · In case of contact with eyes, wash out eyes with large amount of water. · In case of swallowing, consult a doctor. · Shelf life: 5 years. Manufacturing date is indicated on the can. · It is not recommended to apply the compound at existence of mechanical breakages of parts and assemblies. · Tribotechnical compound ACTIVE is compatible with any type of motor oil. · The sediment on the bottom of the can is the main working element of ACTIVE compound - these are microparticles of minerals. It is crucially important to thoroughly stir the contents of the can before pouring it in the engine oil system (sediment color depending on the batch can vary from light green to dark grey and black). · Overdose of compound by 1.5 times is not dangerous for the engine and does not disturb its work. · CompoundACTIVE does not affect thecharacteristics and statusof partsmade of composite materials and rubber. · For providing continuous level of engine protection at each regular oil change it is recommended to apply Active Regular after the complete treatment with ACTIVE . · To protect the new vehicle transmission against wear it is recommended to apply tribotechnical compounds MGSB, AGSB, REDUCER by Atomium. · To maintain the pressure in the fuel system compound HPFP is recommended. Stir Tribotechnical compound ACTIVE thoroughly until natural sediments (active components) are totally dissolved. Apply 1 can of Tribotechnical compound ACTIVE through the regular oil filling neck. (If the volume of the oil system is more than 7 liters, it is necessary to fill in two cans of compound). After applying the engine should run (it is recommended to drive the car) for no less than 20 - 25 min in the regular operation mode. * For new cars it is recommended treatment after a "zero technical maintenance" (at 1000-2000 km run after buying a car). ** For cars with the larger mileage to the next regular oil replacement it is recommended to change the oil filter after the first 1000 km.